Your free site membership allows you to customize your site experience with multiple settings that control your account. Set chart preferences once, and you'll get the same experience each time you log into the site. 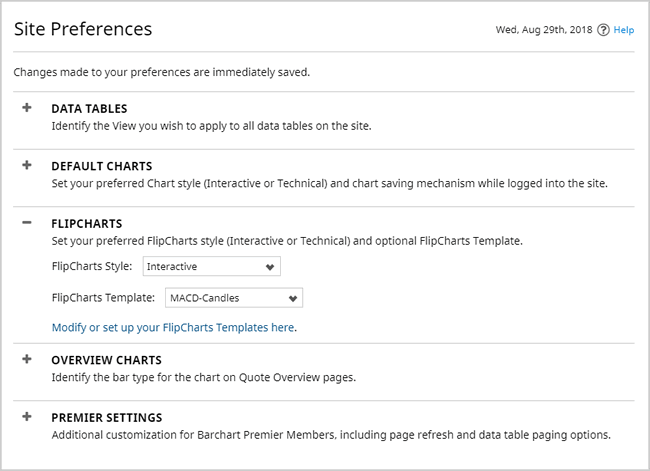 Barchart Premier Members have additional Site Preference settings for even more customization. The Site Preferences page is used to customize your viewing experience on Barchart.com. Changes you make to your Preferences are immediately saved. Default View: You can customize all data tables that display on the site by identifying the View to use. Standard views include the Main View (designed with the page's content in mind), the Technical View, or the Performance View. In addition, you can choose any Custom View as your default. Note: Every Portfolio and Watchlist has its own Default View setting that will take precedence over this setting. Edit the Portfolio or Watchlist record to set its Default View. This section allows you to set your preferences for chart viewing, and also set a default "template" to apply to all charts. A template stores things such as bar type, chart period (intraday, daily, weekly, monthly), studies, etc. Chart Style: Choose from Technical or Interactive charts. Any chart link on the site will take you to your preferred chart page. Interactive Charts were designed to remember and retain your personalized settings when you are logged into the site. Regardless of the option you choose, any tool added to a chart is always saved and will be displayed next time you access that specific chart. Use Last-Viewed Chart Settings: Any "common" changes you make to a chart (aggregation, bar type, studies, etc.) are remembered and carried forward to the next time you view a new chart. This is the recommended selection for a continuous chart viewing experience. Save Every Chart: Every symbol you chart is saved. This option offers the highest level of chart customization, where every symbol can potentially have its own unique chart setup. You will always see the chart as you did the last time you viewed it. However, for futures traders, this option is not recommended, as each time a futures contract expires, the next futures contract chart must again be configured to your preferred settings. Use Chart Template: This option should be used when you want to rely on a chart template to define your preferred chart configuration. When selected, you are asked to also select a default template to apply for every chart you view. You can identify a default template to use for every chart you view, or select "None" to use the site default chart settings. This section allows you to set your preferences for Flipchart viewing (accessible from data tables on the site). Flipcharts Style: Choose to view Flipcharts using either the Technical or Interactive chart style. Flipcharts Template: For the chart style you've selected, you may additionally choose a template to apply to all Flipcharts you view on the site. Note: If no Flipcharts template is selected, a 6-Month Daily OHLC Bar chart will be used. You can change the default Bar Type to use on the Overview Charts appearing on each symbol's Quote Overview page. Settings listed in this area are available only for Barchart Premier members. Free trial available. Left Side Navigation:When viewing the site on your desktop computer, site navigation is visible in the left-hand column. At the very top of this column, you'll see a small blue arrow that can be used to collapse / expand the side navigation. This feature allows you to create more visible room on your desktop to view pages with Custom Views that may cause the page to scroll horizontally. This preference allows you to identify whether side navigation should be Shown or Hidden. Default Watchlist on Home Page: The homepage will show you the last-viewed Watchlist, or will show you a specific watchlist that you choose. Please note that a higher row count (especially on tablet and mobile devices) will affect the performance when loading the page.